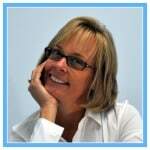 The following is a guest post from regular contributor, Sharon at Mom of 6. Spring is in the air! And with so many of us getting together with family this weekend to celebrate the Easter holiday, I imagine that some of us will spend a little time reminiscing about family vacations from the past, and perhaps even making some tentative vacation plans with family for this coming summer! I know in my house we’ve sure been talking about it this week! Last spring I shared with you a post on How to Use Evernote to Organize Your Vacation Plans that focused on using Evernote as the place to put all of your reservation information, itinerary details, etc. 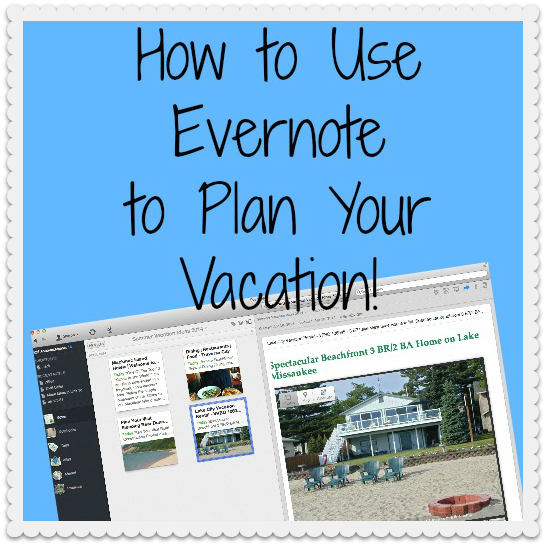 But one of my favorite ways to use Evernote is as a tool to gather together ideas of places to go, where to stay, and things to do- when I am in the early planning stages of a family vacation. 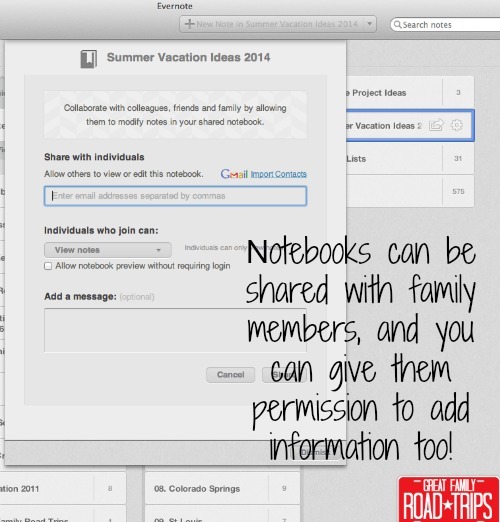 And the cool part is that you can easily share an Evernote notebook with your spouse, kids, in-laws- whomever will be planning and enjoying this vacation with you! And you each can contribute to the notebook- so it is easy to gather everyone’s ideas into one place and then create your vacation itinerary! First Things First….What is Evernote? Simply put- Evernote is a notes-taking, notes-saving application that allows you to create new notes by typing them, clipping them from a website or an email, adding a photo, recording a voice message, even saving a PDF file. Each of these items can be created as a note in Evernote and then your notes can be organized into folders just as you would notes written on paper and placed into a filing cabinet at home. Carley Knobloch from Digitwirl shared this video here on OrgJunkie a while back that does a great job explaining all that Evernote can do for you. Use the Web Clipper to Grab Ideas! Once you have Evernote installed on your computer, make sure that you also install the (free) Evernote Web Clipper add-on for your browser which puts a little icon on your toolbar near your search bar, and it makes it oh-so-easy to quickly “clip” articles from the web and save them into your vacation ideas notebook! When you find an idea that inspires you, simply click on the icon and make your selections on the right side of the screen. You can add tags to your notes (to help you find them later), and you can assign your note to any of your Evernote notebooks. You can even share your note with others on Facebook, Twitter, or in an email right from this window. 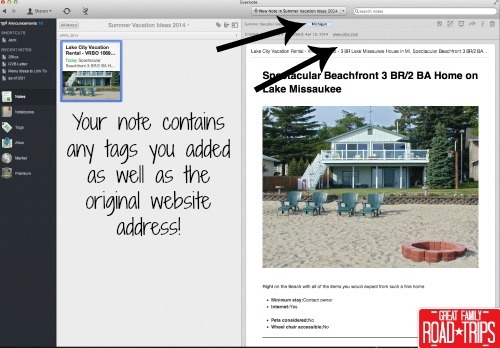 Here’s a look at how that note appears once it is in Evernote. You’ll see the note includes the tag that I added, as well as the full web address from where I “clipped” the note. Having the full web address is helpful if I want to go back to the article later and perhaps make a reservation! And sharing your notebook of ideas with family members is easy-peasy! You just click on the notebook and select “Share this Notebook”. You can then enter the email address with the family members you want to share it with, and you can specify permissions- if you want them to just be able to view the notes, or if you’d like for them to be able to modify the notes too. Ready to to Hit the Road? I am super passionate about family travel. I think that we learn so much by experiencing new places and adventures outside of our backyard. When kids see a mountain range for the first time, dip their toes into the salty ocean, ride on a horse, see a bison, stand next to a waterfall- all of these things just open up their whole world! They learn to marvel at and appreciate nature’s beauty, they are inspired to explore, take on a challenge, overcome a fear. Travel changes us. There are lots of family travel sites out there… but none that I have found that have focused exclusively on the family road trip. So this week I launched my new project…. 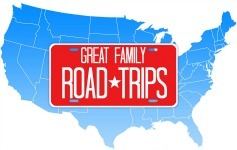 Great Family Road Trips– a site dedicated to ideas and itineraries to inspire you to hit the road with your family. Each week I will share with you itineraries for multi-day road trips you can take throughout the United States (and someday I hope to cover Canada too!). I will cover destinations that I hope will inspire you to want to explore, tips for planning and packing, and reviews of gear, apps, and gadgets to help your road trip run smoothly. If you get a chance, I would really love it if you could stop by Great Family Road Trips and say “hi”! If you get a chance, I hope you’ll stop by to see me at Momof6 – a place where I write about organizing your home, using a family calendar, creating household routines, hosting at-home birthday parties, and holding a DIY summer camp! You can also find me over on GreatFamilyRoadTrips– where I share ideas and itineraries to inspire you to hit the road! There are so many ways to use Evernote! I love your idea about using with to share birthday lists with the grandparents- I haven’t tried that yet! Thanks Mridu! I use Evernote for a lot of things; but I keep forgetting about the web clipper. I see it up in the little menu bar, so I just need to be more conscious about using it. Thanks for the reminder. 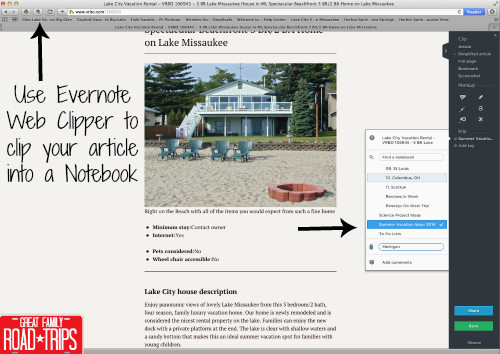 The web clipper is so handy- it really takes Evernote to a new level of easy-peasy!